I want to build a bubble tower in my sump to TRY and eliminate micro bubbles.I saw this in another thread but did not want to hi jack it. Question- if I fill this chamber with bio balls(all will be under the water line) instead of live rock,will nitrates be an issue? I'm thinking bioballs would be a better choice because they are uniform in shape and would fill the chamber better. Current Tank Info: 240g,64g acrylic sump/fuge. I don't have bioballs. I would think they would be a nitrate factory. They might create a water break, but you would be better off finding another way. MobiLinc, a new way to experience your home. Visit the MobiLinc Store for low prices and the best quality on INSTEON home automation gear. What is a water break? Like a ball valve? Actually, you dont want bio-balls in the tower, they will cause more bubbles to get through. Just wide-open water space will allow for the best pressure increase to remove the bubbles. completely submerged bio balls should be no different then any other surface in the tank. they should not trap any detrius. no idea on how they would work as bubble stoppers. For a bubble tower (or any bubble trap for that matter) to be effective, the downward flow rate of the water must be slower than the rise rate of the smallest bubble you are trying to filter. The bubble tower effectively takes the fast moving water coming down the overflow drain (let's say 1" pipe) and in theory slows the flow rate by expanding the diameter of the pipe (say 4"). Here's a sketchup of my bubble tower. The problem is the 1" inlet pipe to the tower is centered and aimed straight down. When the water exits the 1" pipe, you want it to widen out it's flow pattern so that the water moves slowly down to the bottom of the tower. In reality what happens is the 1" water inlet pipe creates a high velocity jet that shoots straight to the bottom of the tower carrying bubbles with it. The water break is some obstruction that you place near the inlet inside the tower to break up and distribute this jet. they do trap detritus, and every surface in your tank, even inside pipes, is coated with nitrate producing bacteria. The main idea is to keep the surface area down. bio-balls that are underwater behave just like ones in a wet-dry, they just dont operate with as much efficiency since they arent exposed to air as much, which contains more oxygen, etc. They are poor as bubble stoppers though, as would eny object be in this matter. You really want to provide a wide-open, unobstructed space for the water pressure to rise and for bubbles to get forced out by their own bouyancy. bio balls, baffles, and rocks will only serve to mix bubbles into the water... think of it like the downdraft towers on an ETSS skimmer: the bio balls are used to mix the bubbles into the water, not get them out. Keelay, bubbles getting into the system in the first place can be minimized by placing a valve on the bubble chamber right where the pipe meets the expansion chamber. This would make a backup drain a good idea. as far as collecting detritus i should not have said doesnt. in comparison to live rock, horizontal surfaces, sponge filters, poly filters and other similar subtances the bio balls will comparitivly not collect detritus. especially in a high flow area. as far as acting the same as a wet dry filter only more poorly, i believe you are incorrect. it has been shown that bacteria that process nitrates actually live symbioticly with the other bacteria in the nitrate cycle. i am unable to find the article at this time, it was in advanced aquarist and the site for old artcles is giving me an error. anyways in a submerged enviroment the nitrosomas live above the nitrobactors and directly beneath them are the anerobic bateria. all living symbioticly. the nitrobacters are right up againest nirosomas because this is where their food is and on it continues. the anerobic bacteria are directly beneath the other guys because the other guys have created a perfect enviroment for them; low O2 and high nitrate. in this article they showed how the largest concentration of anerobic bacteria is directly beneath the other bacteria. using wet/dry bacterial filtration inundates to much O2. this is great for the nitrosomas and nitrobacters but terrible for the anerobic so it breaks the symbiotic bond between the three basic bacteria. this is the reason for the decline in the use of wet/dry filters. without the sybiotic bond you have nitrate disolved in the tank. the only way to get rid of it is with water changes, anerobic bacteria or algae/plants. anerobic bateria cannot live on the surface of things because the O2 will kill them and now because the nitrogen has been already converted into nitrate there is no bacteria to move the nitrogen into an anerobic area. so basicly it does not matter what type of surface, its the ammount of surface and where its at, and will it collect detritus and clog. im not trying to tell anyone how to run there tank. in fact i use a wet/dry filter (though plan to experiment without it). even using a wet/dry i am having none of the problems that people claim they will create. so much for the wet/dry bad theory. but i am always tinkering and plan to try without and see what happens. will also need a bubble trap as wet/dry is an excellent bubble trap. as far as bubble stopping, i assume you are 100% correct and will keep that in mind but i am sure i will try many things. i have about 2g of bio balls laying around as well as plenty of live rock rubble. will also try nothing and plan to try using a foam filter. Last edited by douggiestyle; 02/23/2007 at 03:49 PM. I agree that adding a valve would increase the bubble filtering, but you will still get a jet of water exiting the valve outlet. That negates the purpose of the bubble tower. You want to get as close to laminar flow as possible. the water break is exactly what im using. i got the idea off the tide pool filtration system. seem to work well and also quiets everything. tide pools is slightly conical. as far as collecting detritus i should not have said doesnt. in comparison to live rock, horizontal surfaces, sponge filters, poly filters and other similar subtances the bio balls will comparitivly not collect detritus. especially in a high flow area. as far as acting the same as a wet dry filter only more poorly, i believe you are incorrect. it has been shown that bacteria that process nitrates actually live symbioticly with the other bacteria in the nitrate cycle. i am unable to find the article at this time, it was in advanced aquarist and the site for old artcles is giving me an error. anyways in a submerged enviroment the nitrosomas live above the nitrobactors and directly beneath them are the anerobic bateria. all living symbioticly. the nitrobacters are right up againest nirosomas because this is where their food is and on it continues. the anerobic bacteria are directly beneath the other guys because the other guys have created a perfect enviroment for them; low O2 and high nitrate. in this article they showed how the largest concentration of anerobic bacteria is directly beneath the other bacteria. using wet/dry bacterial filtration inundates to much O2. this is great for the nitrosomas and nitrobacters but terrible for the anerobic so it breaks the symbiotic bond between the three basic bacteria. this is the reason for the decline in the use of wet/dry filters. without the sybiotic bond you have nitrate disolved in the tank. the only way to get rid of it is with water changes, anerobic bacteria or algae/plants. anerobic bateria cannot live on the surface of things because the O2 will kill them and now because the nitrogen has been already converted into nitrate there is no bacteria to move the nitrogen into an anerobic area. so basicly it does not matter what type of surface, its the amount of surface and where its at, and will it collect detritus and clog. im not trying to tell anyone how to run there tank. in fact i use a wet/dry filter (though plan to experiment without it). even using a wet/dry i am having none of the problems that people claim they will create. so much for the wet/dry bad theory. but i am always tinkering and plan to try without and see what happens. will also need a bubble trap as wet/dry is an excellent bubble trap. Doug, Thanks for the description about the nitrate producing bacteria. Great concepts. If you do run into that article, I'm very interested. Please post it here. I had to learn this from experience. I tried the first way and had tons of bubbles making it out (from under )of the tower. I added the break and have had wonderful success with it. I agree. It is quiet, virtually eliminates salt spray, and significantly reduces microbubbles from the start. I'm in the process of collecting ideas and materials to do this. I have two 1" drains.Thinking of running them into a 2" cross fitting w/bushings to accept the 1" drains then down to a 5" pipe to bottom of sump.Top part of cross fitting will have a loose cap to vent air. Any suggestion how to make and secure this 'water break'.Was thinking siliconing something in pvc but dont know what to use or if it will hold up. Iwas also wondering if this design is going to act like a super charged skimmer.forcing bubbles up the smaller pipe. Why not put a T in the camber and some 1" 45's pointing opposite directions? Kinda how an air seperator in a hydronic system works. Like this but the 45's are paralell to the T...kinda tried to draw it isometric. Sweet idea. I think it has potential if you can fit it all inside the tower. I might have missed it, but what is a water break? And should you run this tower all the way to the bottom of the sump? what size pvc should the tower be? (1) The left most drawing is a simple bubble tower with no water break . The fast moving water from the drain enters the bubble tower at the top and carries the bubbles generated in the drain and at impact with the water surface down under the bottom of the bubble tower. This narrow stream of water doesn't spread out when it enters the bubble tower, it continues in this narrow column to the bottom of the sump. This is undesirable since it doesn't filter bubbles as well as it could. This tower configuration however does eliminate the drains sounds and helps minimize salt spray. (2)The right most drawing illustrates adding a water break. A water break is nothing more than some obstruction or mechanism to change the flow of the water entering the bubble tower. Slow the water down so to speak. 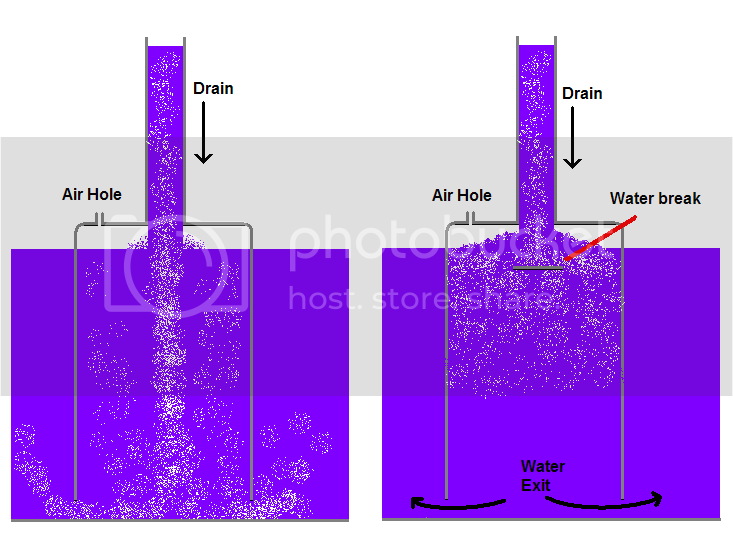 It ideally should spread the flow so that the whole water column in the bubble trap moves down in it's entirety. This is the slowest the water can move for a given input flow rate. And therefore will provide the best bubble filtering. This illustration provides the same level of quieting, but adds better bubble filtering and therefore lessens salt spray than the previous drawing. The make the bubble tower effective the water column should be as wide as you can make it. It also should be as tall as possible. That being said, the water column height can only be as tall as your sump level. So yes the bubble tower should go down to the bottom. 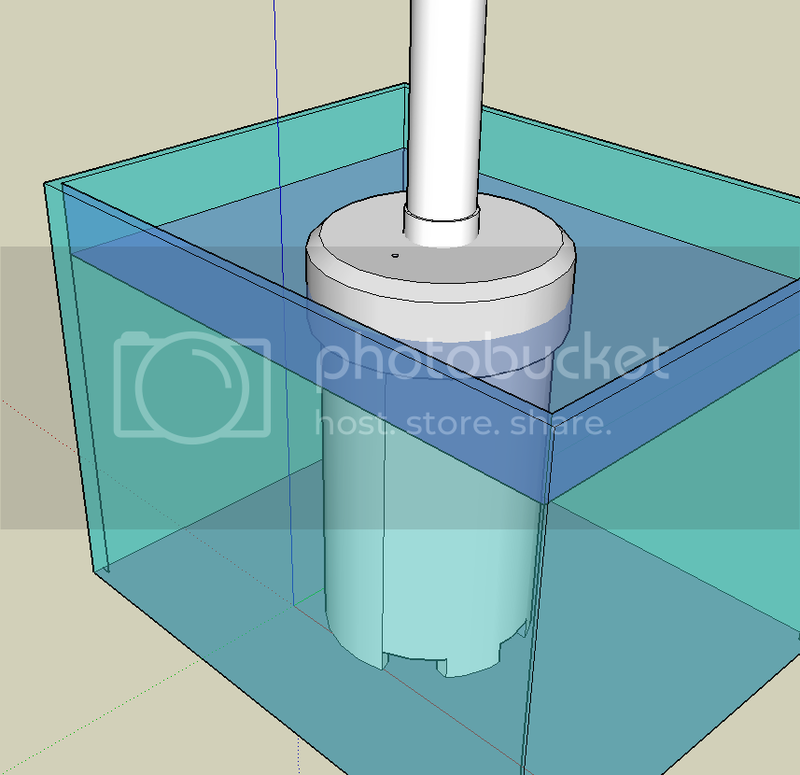 Add some teeth on the bottom (see previous sketchup diagram) for the water to exit out all sides. I used 4" PVC from my 1" drain pipe. I'm have run this up to approx 500 GPH. I have not maxed it out to see what it can do. ok sorta makes sense... would just a regluar T fitting placed upside down work for a break? how did you make your connections go from the 1" up to your 4"
It would be better than nothing. It will shoot two streams horizontally rather than one down. I think you're going to get some directed flows from the dispersement pattern when each of the two flows hit the side walls. I think that's why the previous poster suggested adding the two 45s (90s might work too). The swirling effect you create wouldn't "hit" anything. It might not make any difference. You could try it and mod it later if you need to. This would be easier to show, but it's not too bad. I used 4" PVC for the bubble tower. I used a 4"PVC cap for the top of the tower. I drilled a hole in the 4" cap using a hole saw slight smaller than 1" MPT (Male pipe thread). I used a 1" MPT to 1" Female Slip adapter. I used a heat gun to soften the edges of the hole i just drilled in the cap. I then screwed the adapter threads into the hole. The threads sink into the soft PVC and will form to the male threaded adapter. PVC will harden again after it cools. There are other ways to do this. You could drill a hold for a bulkhead . as far as acting the same as a wet dry filter only more poorly, i believe you are incorrect. it has been shown that bacteria that process nitrates actually live symbioticly with the other bacteria in the nitrate cycle. yes, with live rock they live in concert with each other. In wet-dry filters, fluidized sand beds, sponge filters, sand filters, etc... they dont, and the buildup of nitrates happens no matter what because all of the surfaces cant support the low-O2 bacteria to convert nitrate. Bio-balls, no matter if they are fully submerged or in a wet-dry, have the exact same bacteria and chemical process going on... the relative higher amount of oxygen in air just makes the wet-dry that much more efficient. Im not incorrect, and in a way, what you are saying is supporting what I am saying. Bio-balls behave the same in either setup... its just in a wet-dry they are able to generate/process that much more nitrate. The decline in use of wet-drys (nitrate buildup) is the exact same reason as why fluidized beds, sand filters, undergravel filters, sponge filters, etc... have all seen a decline and are not advised for use in a reef aquarium. Heck, even bio-balls are not a good idea in a reef for this very same reason. Its why CPR Bak Pak 1's were replaced with the reef-ready versions... the bio-bale became a no-no even when submerged. What you are saying is correct about the bacteria, I just think you are applying the information wrong with respect to this media. The bacterial process you speak of only happens in rock and sand... or maybe a low-flow nitrate reactor. Bio-balls = produce nitrates no matter what. I just dont get how you are saying im wrong because what you follow up for reasoning is supporting what I am saying. Im confused... I think you should step back just for a moment and take another look at how you are applying the information here. Im sure its just a matter of moments before the light goes off above your head and you see what Im saying. i am unable to find the article at this time, it was in advanced aquarist and the site for old artcles is giving me an error. anyways in a submerged enviroment the nitrosomas live above the nitrobactors and directly beneath them are the anerobic bateria. all living symbioticly. the nitrobacters are right up againest nirosomas because this is where their food is and on it continues. the anerobic bacteria are directly beneath the other guys because the other guys have created a perfect enviroment for them; low O2 and high nitrate. in this article they showed how the largest concentration of anerobic bacteria is directly beneath the other bacteria. using wet/dry bacterial filtration inundates to much O2. this is great for the nitrosomas and nitrobacters but terrible for the anerobic so it breaks the symbiotic bond between the three basic bacteria. this is the reason for the decline in the use of wet/dry filters. without the sybiotic bond you have nitrate disolved in the tank. the only way to get rid of it is with water changes, anerobic bacteria or algae/plants. anerobic bateria cannot live on the surface of things because the O2 will kill them and now because the nitrogen has been already converted into nitrate there is no bacteria to move the nitrogen into an anerobic area. so basicly it does not matter what type of surface, its the ammount of surface and where its at, and will it collect detritus and clog. im not trying to tell anyone how to run there tank. in fact i use a wet/dry filter (though plan to experiment without it). even using a wet/dry i am having none of the problems that people claim they will create. so much for the wet/dry bad theory. but i am always tinkering and plan to try without and see what happens. will also need a bubble trap as wet/dry is an excellent bubble trap. filter. I think you would agree with me on that point simply for the fact that people without wet/dry filters have nitrate problems. In addition, because I have a wet/dry filter and do not have nitrate problems then it is safe to say that wet/dry filters alone do not cause nitrate problems. Still surface area is surface area. Moreover, high flow is high flow. Therefore, the more live rock and the more flow you have around it the closer you come to the parameters of a wet/dry filter, according to your suggestions. I think we would agree that is not the case. The argument could be made that live rock does not cause the problem because it is so porous therefore; it creates those dead zones needed for anaerobic bacteria. Well if they are dead then little nitrate will enter as well as the O2, now that is a contradiction. Yet, flow rates are frequently being increased within the tank. I do not believe that is the case nor would most people. lets say we perpetuate this belief that live rocks porosity is what makes its surface area ok. Then it can be assumed that any thing relatively nonporous added to the tank would create surface area similar to bioballs. Well this would create a contradiction for all those that have used less porous "base" rock, fossilized reef rock (Florida live rock), ceramic rock, homemade rock (the kind that many people are making that does not use rock salt to make it more porous) or limestone as base rock. Do to their lower porosity all these products would create the nitrate problems you have cited especially if they are in a high flow area. I think we would all agree that is not the case. Look at this http://www.advancedaquarist.com/2007/2/aquarium 10,000 pounds of limestone. That is 1/4 of all the rock (by weight) in the tank. No nitrate problems. So using all the evidence presented to us it can safely be said that increasing surface area with in the tank does not create a nitrate problem regardless of what its constructed of. At least that is my theory, a theory based on available evidence. In addition, in regards to CPR, they may only be reflecting consumer demand. The fact that they removed the bio balls does not mean that CPR has tested their effect and found that the bioballs ruin the overall health of the tank. If it sounds like I am being vague, its because I am not sure on what this all means for the tank. That is why I also suggested that no one use my drivel to design his or her tank around. However, continue doing what you are doing as long as it works. All this aside it is a moot point in regards to this thread because as you have pointed out, as a bubble remover, you have found that submerged bio balls work poorly. I trust that you are correct. Wet Drys are notorious nitrate producers... just because you havent seen that result yet, or perhaps your LR is keeping up. People can have nitrate problems for a variety of reasons beyond a wet-dry, so to deduct that wet-drys must not be part of the problem is not accurate. You need to talk with Bornemann, Calfo, or maybe Holmes-Farley. There is plenty of work on the subject... bio-balls were designed to convert ammonia and nitrite to nitrates. Its part of the process. Part of that process also results in the release of phosphates by the aerobic bacteria.